Sunny dandelion – Pissenlit ensoleillé by Monteregina (Nicole), on Flickr. Used under a Creative Commons license. Right around the winter solstice is when I open my first bottle from the year’s batch of dandelion wine. A white wine that is bright and floral, dandelion wine is good chilled or heated on the stove with a cinnamon stick. It’s like drinking spring sunshine. Have no dandelion wine to enjoy this winter? Save this recipe and make some in the spring. It should be ready to go by next winter, and age well for a few years thereafter.If you live in a place where flowers are still blooming, make wine now by substituting an in-season, non-fragrant edible flower. 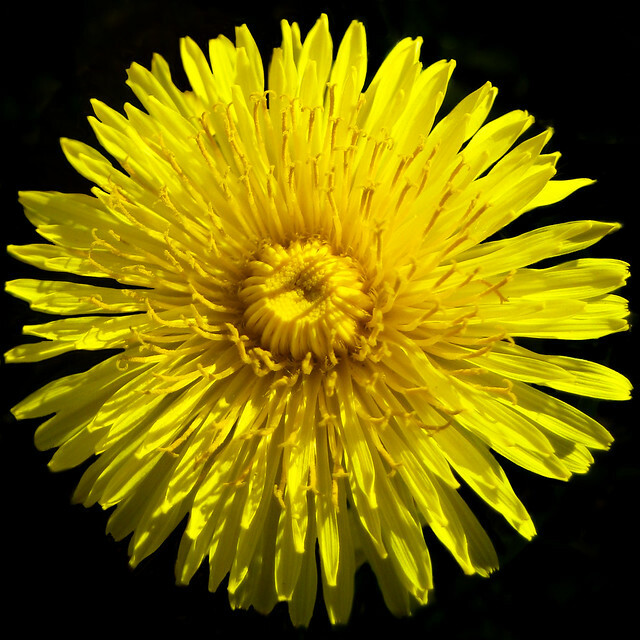 Pick dandelions mid-morning to early afternoon from an area free of pesticides, when the dew has evaporated but the flowers are still open like a lion’s mane. Put the flowers into a crock with the boiling water. Let sit overnight. Strain flower water into soup pot. Juice the fruit and chop the rinds roughly. Set aside the juice. Add the rinds to the soup pot. Bring to a boil then simmer, covered, for 25 minutes. Turn off heat and stir in sugar, then juice. Proceed with steps 4 to 10 of the Basic Herbal Wine recipe.